Our goal is simple: help caregivers across West Michigan discover the benefits of baby carriers. To achieve our goal, we rely on our hard working volunteers, supportive community, and generous donors. In 2015, we recruited 3 additional educators to our team, increased our presence both in person and online, and expanded our lending library. We raised over $5,000, nearly 70% of which came directly from our membership. 80% of our funds were invested in our lending library, bringing a wider range of carrier options to our area. 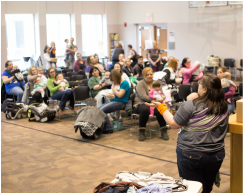 We provided babywearing education to over 300 new visitors across the Greater Grand Rapids area.​﻿We welcomed 145 new sustaining members, 41 renewing members and 3 new educators: Emily, Alicia, and Lisa (pictured above). Our 53 events saw over 1400 attendees, and our Facebook group grew to over 1800 members! 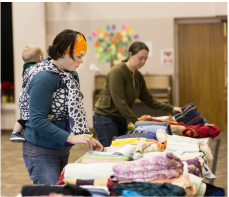 For International Babywearing Week, we held online Periscope sessions to reach out to locals who may not have made it to a meeting. For our lending library, we added 83 carriers: 3 stretchy wraps, 10 mei tais, 12 ring slings, 26 woven wraps, and 33 soft structured carriers! We now have over 200 carriers available for members to take home and try each month. We raised $5,224.23 for babywearing education in 2015. Nearly 70% of our revenue came directly from our members in the form of sustaining memberships. Our volunteers raised 17% via fundraisers or donations. The remainder of our income came from selling unpopular carriers, unsolicited donations, or other sources. 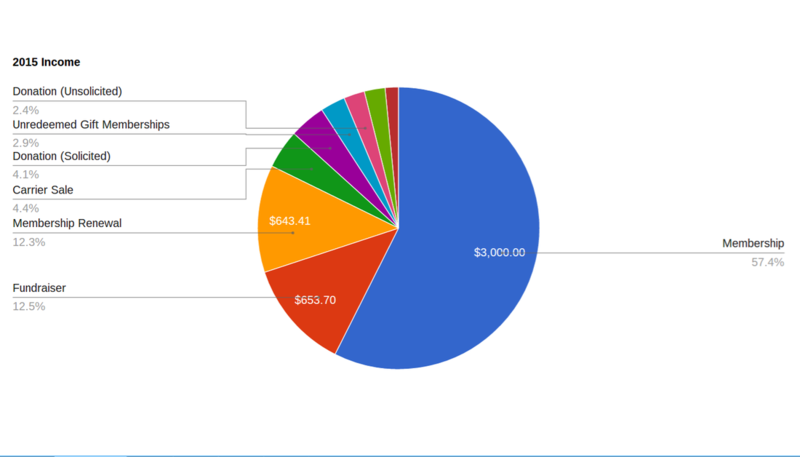 We had $5,703.24 in expenses, 80% of which was invested directly into our lending library. Supplies to keep the organization and lending library running, like laundry detergent or tags for our carriers, accounted for 14% of our budget. Other small expenses like marketing, fees, etc. comprised the rest of our expenses. See our 2014 Annual Report here.